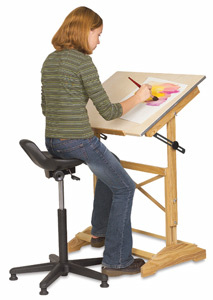 Get right up to your easel comfortably with this new painter's stool. The soft urethane seat sits securely atop a reinforced base with heavy-duty floor glides. You can easily adjust both the height and tilt while seated. Height adjusts from 22" to 30". To view a PDF of the assembly instructions and parts list for the Alvin Synchro-Tilt Painter's Stool, please click here.